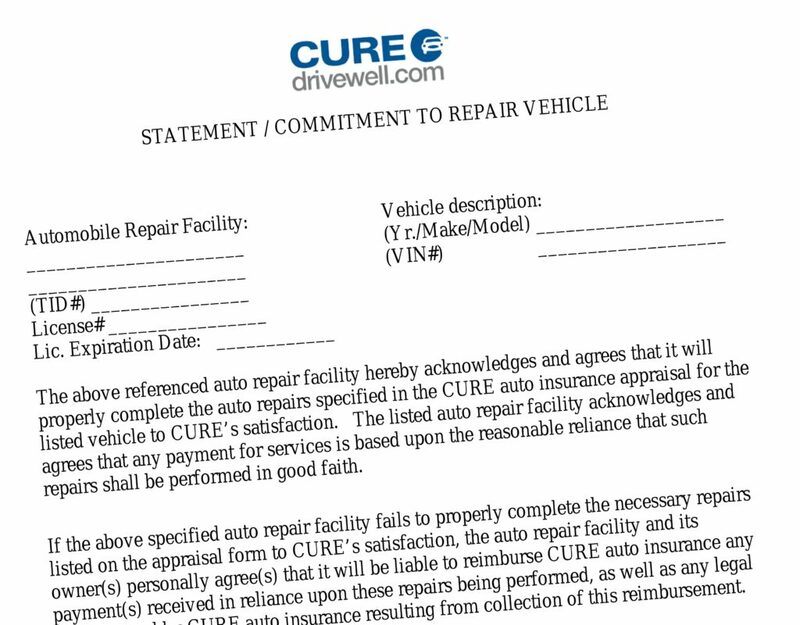 CURE Insurance has attempted to make a non-DRP shop sign a form committing a shop to follow the carrier’s estimate or reimburse CURE the proceeds from the work. The “commitment to repair” form from the Pennsylvania and New Jersey insurer also declares the business owner personally liable for that payment in the event the shop goes out of business. Email messages left over the past two weeks for CURE CFO Eric Poe, whom the small insurer said would be the appropriate contact, were not returned as of Monday. The shop which tipped us to the form said it’d received it twice, once following CURE’s initial estimate and once following a supplement by the shop. The shop was not a member of CURE’s direct repair program and had an assignment of benefits from the CURE policyholder. In both cases, the shop refused to sign the document. But it’s unsettling to think what would happen to a less savvy shop which had agreed to CURE’s overreaching demands. Let’s dissect the form. But first, one caveat: The commentary in this article, including that from notable collision repair attorney Erica Eversman, is meant to be informational and is not intended as actual legal advice. Shops should consult with an licensed attorney qualified in the relevant subject matter before making business or contractual decisions. “The above referenced auto repair facility hereby acknowledges and agrees that it will properly complete the auto repairs specified in the CURE auto insurance appraisal for the listed vehicle to CURE’s satisfaction,” the form commits the signatory shop. “The listed auto repair facility acknowledges and agrees that any payment for services is based upon the reasonable reliance that such repairs shall be performed in good faith. The document might have been meant as a fraud-fighting measure, meant to curtail shops which unlawfully take CURE’s money for repairs they’re not actually performing. In addition to breaking the law, such shops ruin the reputation of the entire collision repair industry, and we obviously have no problem with CURE or law enforcement trying to check such activity. But here’s the problem in this case. Whether intentionally or unintentionally, the contract’s wording also seems to lock a collision repairer into CURE’s estimate, potentially forcing a shop to either eat the cost of subsequent supplement or ignore that work. Of course, the shop still retains all of the liability if the CURE adjuster or appraiser — who isn’t necessarily a trained collision repair professional — missed something. The insurer is saying “’Fix it this way, even if it’s wrong,’” as Eversman put it. “They just say these things,” she said. But should something go wrong, it’s still on the shop — even though they followed the insurer’s directions, she said. “The shop has 100 percent liability for any and all repairs that they make,” Eversman said. The requirement that a shop perform the repairs in the appraisal to CURE’s satisfaction raises the question of what would happen if a shop which signed this submitted a supplement anyway, or at least told a customer what other work the repairer realized was left unaddressed in the first estimate. A shop’s signing this form doesn’t compel the customer to accept anything other than pre-loss condition (or cash value) — they could still demand the supplemental work be done. This renders a shop’s incorporation or limited liability company status worthless. The point of such business structures is so company owners can’t be held responsible for their business’ debts. For example, if an incorporated shop goes out of business owing a frame machine manufacturer tens of thousands of dollars, the manufacturer can’t demand the owner pay it back out of their home savings account — only from what funds are available once the business liquidates. Under this document, CURE could still go after the shop owner. 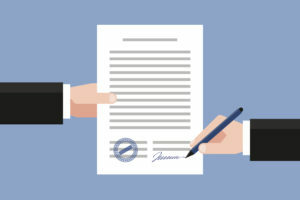 Eversman wondered if the CURE contract would even hold up in court since the shop doesn’t receive any consideration for signing it — the shop is giving up rights in return for zero benefit. But “who’s got the time or the money to drag that through court?” she said.